Electronic Delivery. No one likes to have sensitive or tough discussions with employees, peers, clients or anyone at work. But, when it’s time to have one, you must be prepared. 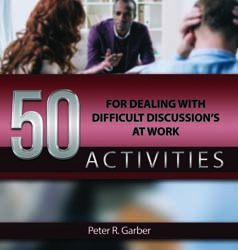 That’s why 50 Activities for Dealing with Difficult Discussions at Work is such a valuable training tool. Teach employees how to be better and more confident communicators – in just a matter of minutes. Each fully reproducible activity offers practice in a key skill related to handling difficult conversations including how to broach a touchy subject, stay on topic, handle one-sided and circular discussions, and much more. Included with each activity are step-by-step instructions on how to present the lesson and, in many cases, handouts participants can use as refreshers of the principles and concepts learned. Beginning the Dialogue focuses on face-to-face and phone discussions, body talk, listening, building rapport and credibility. Sensitive Discussions helps you pick the time and place, set the tone and plan “eggshells” discussions. Tough Discussions prepares you to deal with avoidance, shut-downs, emotions and other difficult responses. Discussion Connections describes the different types of work discussions and their purposes. Next Discussions highlights the importance of committing to a future dialogue. Discussion Communication shows how words have different meanings and must be chosen carefully. You can use these activities as stand-alone lessons, ice breakers, part of another training program or as a complete training program. There’s no better or faster way to help employees proactively face these inevitable challenges and deal with them whenever they occur.